Tell us your story… Patrick and I first met through some mutual friends while we were both attending Cazenovia College. As fate would have it, we were actually from neighboring towns, but it took going away to college for us to actually meet! Where did you two tie the knot? The Otesaga Resort in Cooperstown, NY. The very first time I had ever been there was in 2008 with my cousin and a high school friend. I fell in love with the location and thought to myself, “This is where I would want to get married.” Fortunately, Patrick and I both love historical buildings, and small town charm. The Otesaga was the perfect combination of both. It was the first venue we looked at in person during our search, and we knew right then and there that we had to search no more. 9 years after the fact, my wish came true- the weather cooperated like it never does in Central New York and we had a magical ceremony by the lake. Spill the details about your wedding! I am very much into the whole shabby chic look. I pulled ideas from here and there (Pinterest mostly) which resulted in a mix of new and old. Quite a few of the details were hand made by me- from the table numbers to the hand painted backdrop banner. The end result was what I called “The Secret Garden” look. Peonies and greens decorated the tables, candelabras with greenery wrapped around the stems were scattered throughout, and vintage books and brass candle holders were the perfect addition. Our “place cards” were little honey jars filled with local honey from a family friend’s beehives. My bridesmaids were in varying pastel hues of the same dress while the groomsmen provided the perfect contrast in their navy pants, bow ties and suspenders. 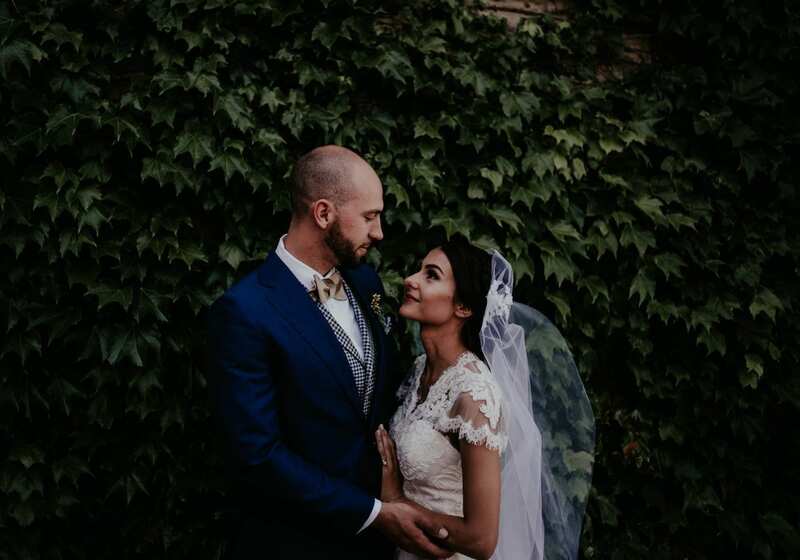 Patrick somehow managed to tolerate the heat in a three piece suit from Suit Supply, and I felt like a million bucks in my bespoke wedding gown. It was a family affair in every way- my sister was my Maid of Honor, and my cousin and Patrick’s sister were my two other Bridesmaids. Patrick’s cousin was his Best Man, and my two brothers were his Groomsmen. My baby brother was my ring bearer, and my niece and nephew played the roles of Flower Girl and Junior Ring Bearer. To top it all off- my cousin helped to design and decorate my dream wedding, while another cousin was our MC! The ceremony was held outdoors under a decorated arbor that Patrick made for our day. It was a gorgeous, sunny, 80-something early summer afternoon. Our reception was filled with laughter and wonderful memories- complete with a poem my cousins dug up that my eleven-year old self wrote about love. We were surrounded by family and friends- it was the perfect day. Patrick and I continued to remark how we couldn’t believe that this was our wedding. After all the hard work- we had pulled it off! It was truly a dream come true wedding! What was your favorite moment? Patrick and I took the traditional route of not seeing each other AT ALL the morning of the wedding. We even exchanged wedding gifts and letters at the corner of the building so as not to get a glance of one another. By the time I was waiting to walk the aisle with my father I was such an emotional mess, but it made that moment all the more memborable. Having my father by my side as I walked (okay, maybe speed walked) to my future husband’s side left my heart swelling with so much emotion I thought it would burst.